A meniscus is a crescent-shaped fibrocartilaginous structure that partly divides a joint cavity, unlike articular discs, which completely separate the cavity. Menisci are present in the knees and the acromioclavicular, sternoclavicular, and temporomandibular joints. A small meniscus is also seen in the wrist joint. This article focuses on the menisci of the knees. Stability. The ligaments are the most important stabilizers, with the menisci assuming a secondary function. This secondary function is enhanced with intact ligaments. Lubrication and nutrition. The knee menisci act as spacers between the femur and the tibia. By doing so, they prevent friction and contact between the distal femur and tibia and allow for the diffusion of the normal joint fluid and its nutrients into the articular cartilage. Maintenance of the integrity of the articular cartilage is critical to preventing the development of post-traumatic or degenerative arthritis. Shock absorption The menisci lower the stress applied to the articular cartilage; thereby, they have a role in preventing the development of degenerative arthritis. 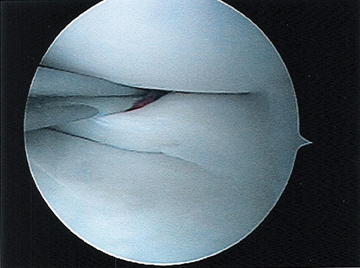 Clark and Ogden studied the natural development of the menisci in the normal knee. The shape of the meniscus is formed at the eighth week of gestation, about the time when the knee joint is fully formed.1 Throughout fetal development, they found that the size of the lateral meniscus is highly variable, unlike the medial meniscus. Generally, congenital anomalies affect the lateral meniscus, most commonly a discoid meniscus, although discoid medial menisci can occur much less frequently. We will review the common meniscal variants, which include hypoplastic menisci, absent menisci, anomalous insertion of the medial meniscus, discoid lateral meniscus, including the Wrisberg variant, and discoid medial meniscus. 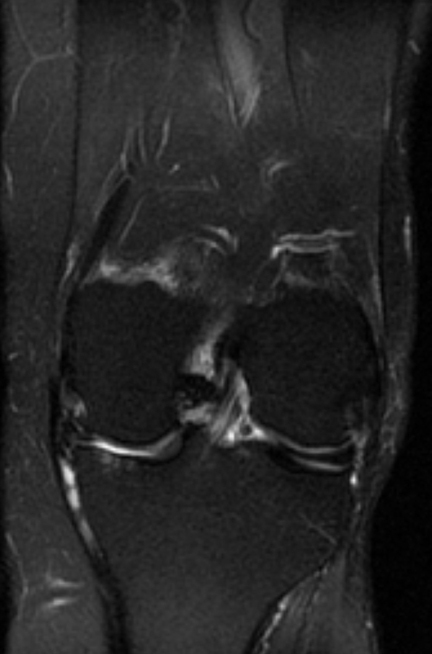 Normal measurements of the posterior horn of the medial meniscus may vary, but the posterior horn is usually much larger than the anterior horn (the posterior horn usually measures 12 mm to 16 mm in the sagittal plane in an adult), and approximately twice the size of the anterior horn on sagittal magnetic resonance (MR) images. 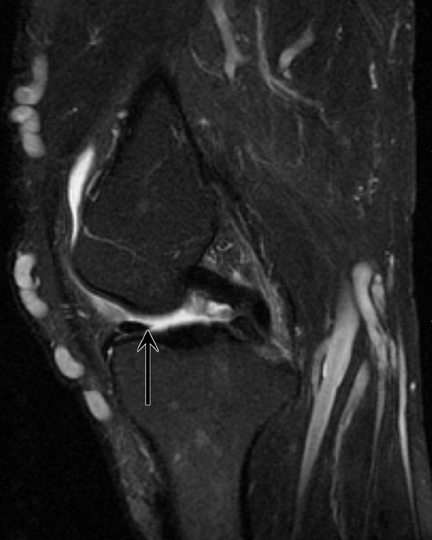 Imaging characteristics of the posterior horn of the medial meniscus include a triangular hypointense structure on sagittal images on T1, proton density, and fat-saturated FSE T2-weighted images, with a slab-like appearance on coronal images. 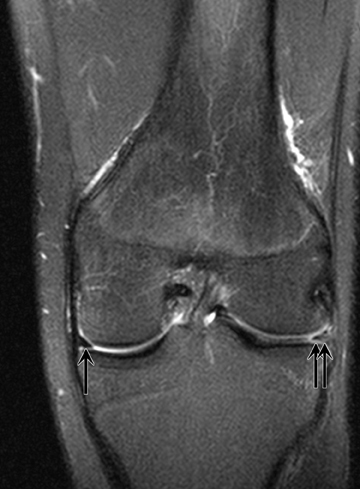 Congenital absence of the meniscus is extremely rare and has been documented in TAR syndrome and in isolated case reports.2,3 The congenitally absent meniscus appears to influence the development of the distal femur and proximal tibia, and in the case report of bilaterally absent menisci reported by Tolo et al,3 the proximal medial tibia was convex and the distal medial femoral condyle was saddle shaped. That reported case was also associated with congenital absence of the cruciate ligaments. When the cruciate ligaments are absent, most commonly the anterior cruciate ligament (ACL) is affected. These findings are also frequently associated with genu varus deformity (Figure 3). 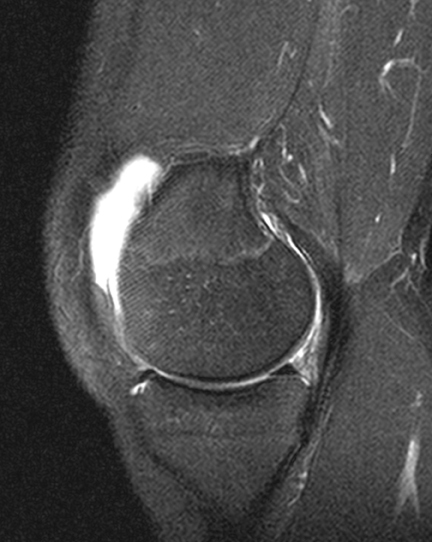 Tears of the anterior horn of the medial meniscus, an inferior patella plica, and ACL tears can be mistaken for AIMM, but carefully tracing the ligament will help to exclude these conditions.5 In the first instance, tears of the lateral aspect of the anterior horn of the medial meniscus are extremely uncommon and should not be a diagnostic problem in practice. Also, the inferior patella plica inserts on the patella or Hoffa’s fat pad, and should be fairly easily differentiated from AIMM. A tear of the ACL should also, in practice, not be a diagnostic dilemma, as the AIMM band will be seen to extend to the medial meniscus, and not be confined to the ACL as seen in an ACL tear. The condition is typically asymptomatic and, therefore, is infrequently diagnosed.14 The most frequent symptom is pain that usually begins with a minor trauma; however, other symptoms include clicking, snapping, and locking during movement, and less commonly joint-line tenderness, reduced mobility, and a “giving-way” sensation.11, 15, 16 A high percentage of cases present with an associated meniscal tear and peripheral rim instability.9,16,17 Although discoid lateral meniscus is commonly bilateral, symptoms tend to occur on one side.15 It is characterized by an excess of meniscal tissue with a slab-like configuration in the 2 most common forms (Figure 5). Type 1: A complete slab of meniscal tissue with complete tibial coverage. 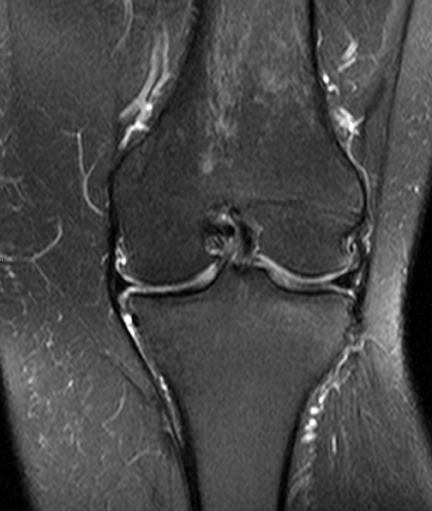 Type 2: An incomplete slab of meniscal tissue with 80% coverage of the lateral tibial plateau. 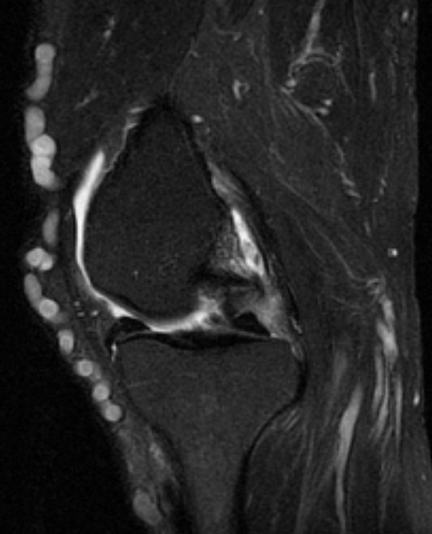 Type 3: The Wrisberg variant, where the meniscus may have a normal morphology but lacks its posterior attachments; ie, the meniscotibial ligament and meniscal fascicles. Type 1 is most common, and type 3 is least common. 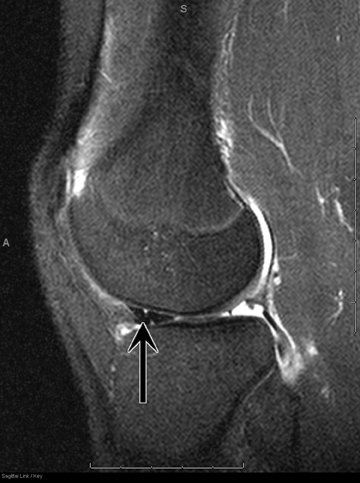 Monllau et al in 1998 proposed adding a fourth type, the rare ring-shaped meniscus, to the classification. 75% for the ratio of the sum of the width of the anterior and posterior horns to the meniscal diameter on a sagittal slice that shows a maximum meniscal diameter. In the Wrisberg variant, the morphology of the meniscus may be normal, but the posterior fascicles and meniscotibial ligament are absent and a high signal fluid cleft interposed between the posterior horn and the capsule may simulate a peripheral tear (Figure 6).23 The only attachment of the posterior horn is the Wrisberg meniscofemoral ligament, and the posterior horn may translate or rotate due to hypermobility. The meniscus may also become hypertrophic. Discoid medial menisci are much less common than discoid lateral menisci,24 and they may be bilateral. When bilateral, they are usually symmetric. The reported prevalence is 0.06% to 0.3%.25 Problems encountered in a discoid medial meniscus are the same as a discoid lateral meniscus, including a propensity for tears to occur and with mechanical features of clicking and locking. 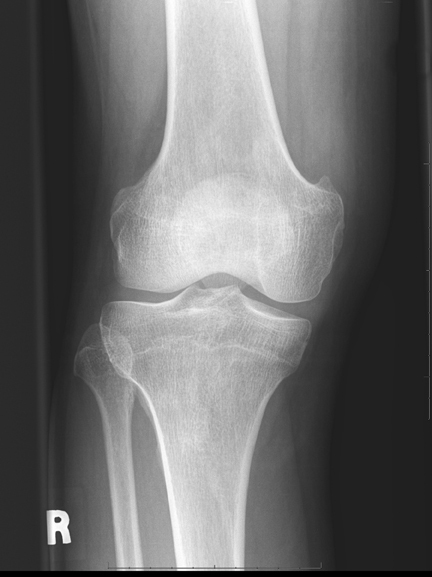 Radiographs may show cupping of the medial tibial plateau, proximal medial tibial physis collapse and widening of the medial joint space (Figure 7). There are no specific MR criteria for classifying discoid medial menisci, and the MR criteria for discoid lateral menisci are used for discoid medial menisci (Figure 8). 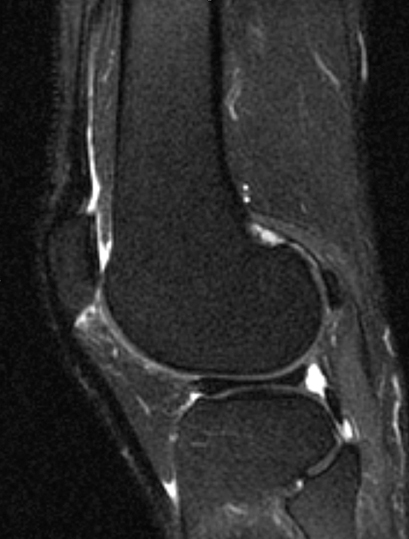 A Wrisberg type variant has not been documented in the medial meniscus. Normal variants of the meniscus are relatively uncommon and are frequently asymptomatic, although there is a greater propensity for discoid menisci to tear. However, recognizing these variants is important, as they can be misinterpreted for more significant pathology on MRI. The most common of these meniscal variants is the discoid lateral meniscus, and the least common is complete congenital absence of the menisci. Clark CR, Ogden JA. Development of the menisci of the human knee joint: Morphologic changes and their potential role in childhood meniscal injury. J Bone Joint Surg Am. 1983;65:538-547. Heron, D, Bonnard C, Moraine C,Toutain A. Agenesis of cruciate ligaments and menisci causing severe knee dysplasia in TAR syndrome. J Med.Genet. 2001;38;e27. 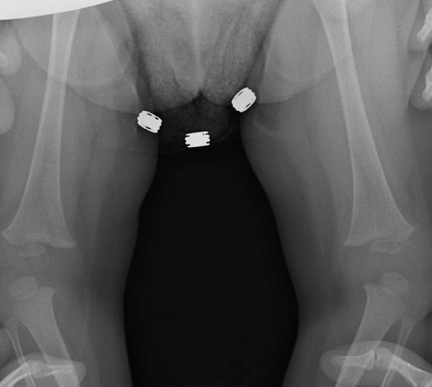 Tolo VT. Congenital absence of the menisci and cruciate ligaments of the knee: A case report. J Bone Joint Surg. 1981;63:1022-1024. Monllau J, Gonzalez G, Puig L, Caceres E. Bilateral hypoplasia of the medial meniscus. Knee Surg Sports Traumatol Arthrosc. 2006;14:112-113. Nakajima T, Nabeshima Y, Fujii H, et al. 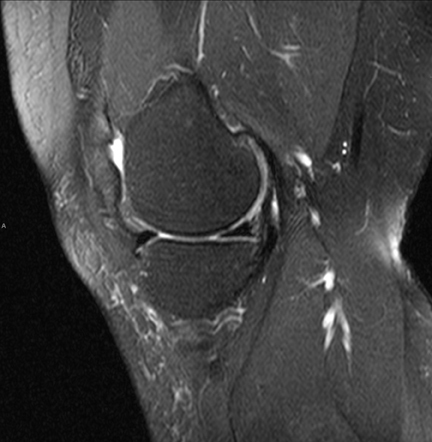 Symptomatic anomalous insertion of the medial meniscus. Arthroscopy. 2005;21:629. Dickhaut SC, DeLee JC. The discoid lateral-meniscus syndrome. J Bone Joint Surg Am. 1982;64:1068-1073. Neuschwander DC, Drez D Jr, Finney TP. 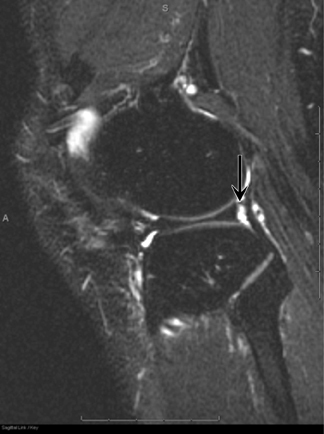 Lateral meniscal variant with absence of the posterior coronary ligament. J Bone Joint Surg Am. 1992;74:1186-1190. Rohren EM, Kosarek FJ, Helms CA. Discoid lateral meniscus and the frequency of meniscal tears. Skeletal Radiol. 2001;30:316-320. Fukuta S, Masaki K, Korai F. Prevalence of abnormal findings in magnetic resonance images of asymptomatic knees. J Orthop Sci. 2002;7:287-291. Kelly BT, Green DW. Discoid lateral meniscus in children. Curr Opin Pediatr. 2002;14:54-61. Kaplan EB. Discoid lateral meniscus of the knee joint: Nature, mechanism, and operative treatment. J Bone Joint Surg Am. 1957;39:77-87. Ross JA,Tough ICK, English TA. Congenital discoid cartilage. Report of a case of discoid medial cartilage, with an embryological note. J Bone Joint Surg Br. 1958 40:262-267. Davidson D, Letts M, Glasgow R. Discoid meniscus in children: Treatment and outcome. Can J Surg. 2003;46:350-358. Connolly B, Babyn PS, Wright JG, Thorner PS. 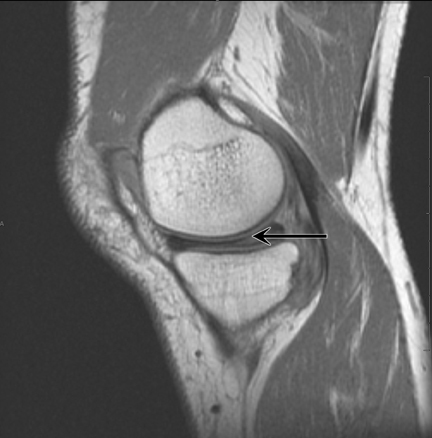 Discoid meniscus in children: Magnetic resonance imaging characteristics. Can Assoc Radiol J. 1996;47:347-354. Rao PS, Rao SK, Paul R. Clinical, radiologic, and arthroscopic assessment of discoid lateral meniscus. Arthroscopy. 2001;17:275-277. Watanabe M, Takada S, Ikeuchi H. Atlas of Arthroscopy. Tokyo, Japan:Igaku-Shoin;1969. Youderian A, Chmell S, Stull MA. 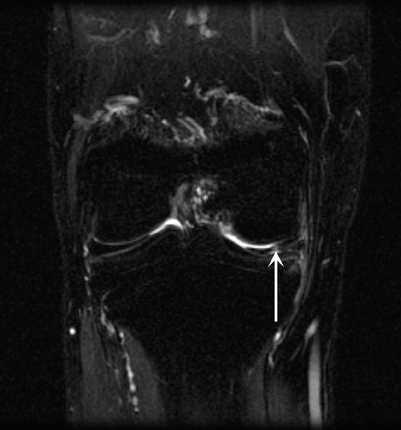 Discoid lateral meniscus. Applied Radiology. 2008;37:30-32. Kim SJ, Moon SH, Shin SJ. 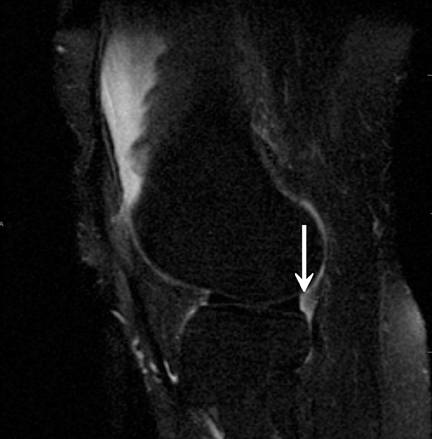 Radiographic knee dimensions in discoid lateral meniscus: Comparison with normal control. Arthroscopy. 2000;16:511-516. 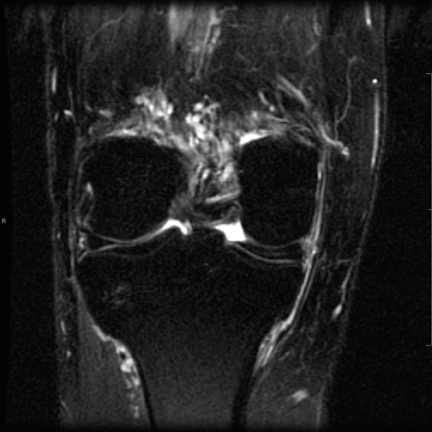 Samoto N, Kozuma M, Tokuhisa T, Kobayashi K. Diagnosis of discoid lateral meniscus of the knee on MR imaging. Magn Reson Imaging. 2002;20:59-64. Kim EY, Choi SH, Ahn JH, Kwon JW. 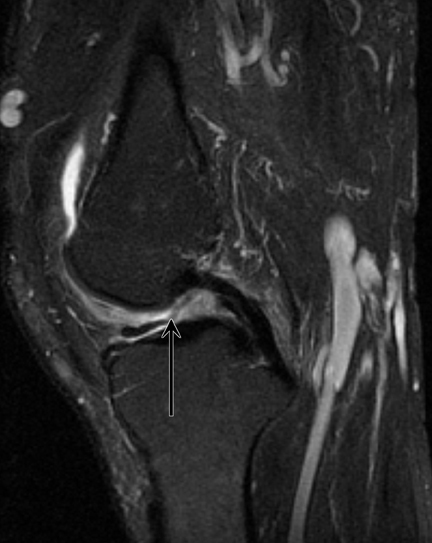 Atypically thick and high location of the Wrisberg ligament in patients with a complete lateral discoid meniscus. Skeletal Radiol. 2008;37:827-833. Singh K, Helms CA, Jacobs MT, Higgins LD. 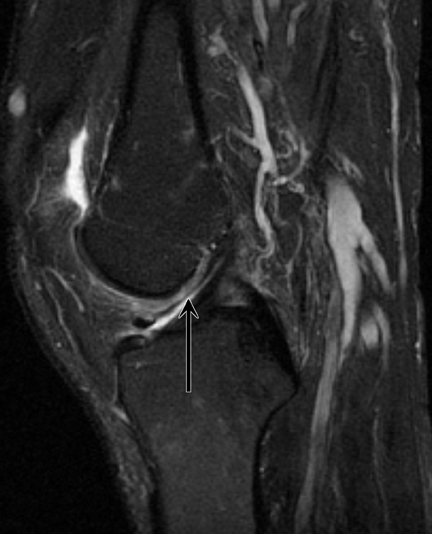 MRI appearance of Wrisberg variant of discoid lateral meniscus. AJR Am J Roentgenol. 2006;187:384-387. Resnick D, Goergen TG, Kaye JJ, et al. 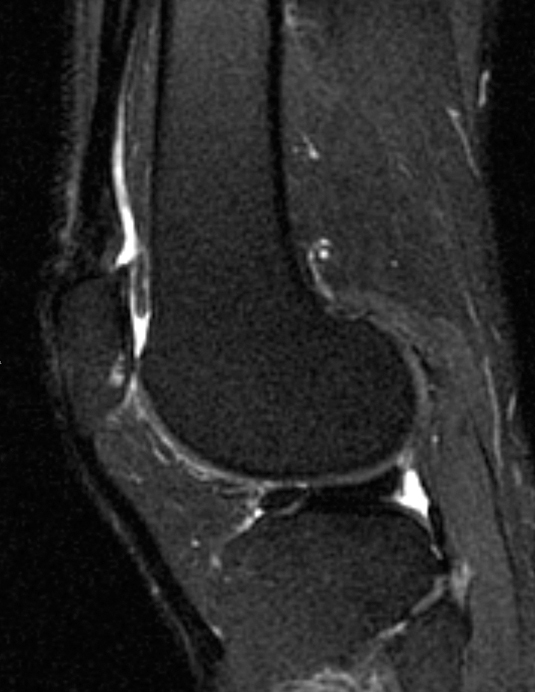 Discoid medial meniscus. Radiology. 1976;121:575-576. Tachibana Y, Yamazaki Y, Ninomiya S. Discoid medial meniscus. Arthroscopy. 2003;19:E12-18. Kim SJ, Choi CH. Bilateral complete discoid medial menisci combined with anomalous insertion and cyst formation. Arthroscopy. 1996;12:112–115. Pinar H, Akseki D, Karaoglan O, et al. Bilateral discoid medial menisci: Case report. Arthroscopy. 2000;16:96-101. Normal variants of the meniscus. Appl Radiol. Dr. Ali, Dr. Dass, and Dr. Shah are in the Department of Radiology, and Dr. Sewards is in the Department of Orthopedic Surgery, Temple University Hospital, Philadelphia, PA.